“Farm Beyond the Grange”, 7″ x 10″, Framed in Silver Wood to 12″ x 15″. This painting is currently on exhibit at The Grand Summit Hotel. 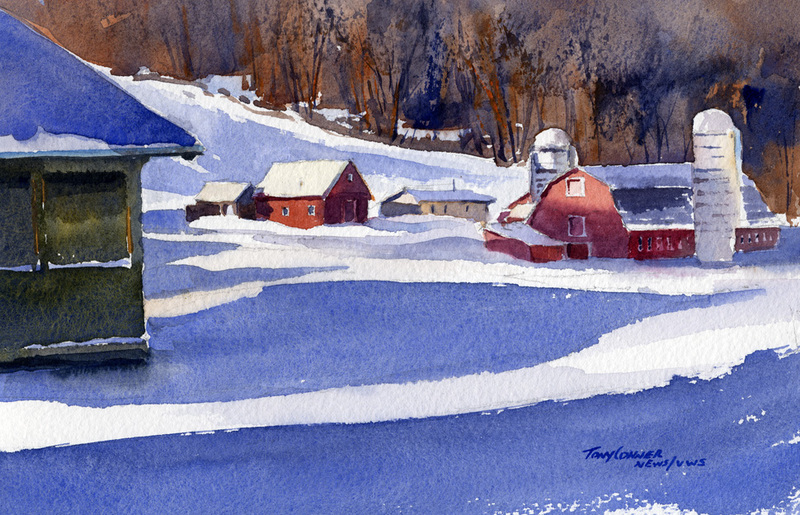 A patriotic winter scene – red, white and a whole lotta blue! With all the snow lately, the landscape is completely snow covered – meaning there are blue shadows everywhere on sunny days. This scene is of the Nolan Farm in West Arlington, Vermont. It is a very picturesque farm with a somewhat unusual arrangement of buildings and silos. This area is also Norman Rockwell territory. His home and studio are just out of the picture to the left. The Grange Hall Pavilion that anchors the left edge of the painting was the sight of concerts, community meetings, picnics and dances. Apparently, Mr. Rockwell was in attendance at many of them during his years in Vermont. Why to Buy? Purchase at direct-from-the-artist prices. Direct sales save the cost of framing, transport, inventory, promotion and gallery commissions. Beyond getting a good deal, you’ll be – supporting a working artist – enriching your own life by owning a unique creation you can enjoy every day – creating a long-lasting legacy for your family – getting in on the ground-floor of a great investment Oh, and by the way – if it doesn’t match the drapes, there is a money-back guarantee!